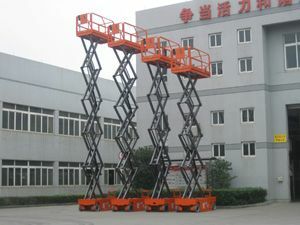 Our electric scissor lift, sometimes also referred to as self propelled scissor lifts or electric scissor platform, is mainly used to help workers get to high and inaccessible places in various fields like maintenance, construction, etc. It can be totally controlled by a single person and is mainly used to lift limited weight. 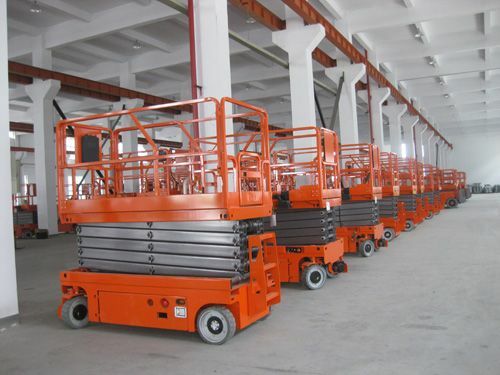 Besides, our lift can be used in industrial settings and can be easily driven along narrow aisles. 1. Its roll-out extension platform provides more workspace. 2. Firmly fixed guardrails make it easy to get through doorways, into elevators and throughout other height-restricted areas. 4. Zero-radius turning and compact design make it easier to work in and around confined places. 5. 25% grade ability when driving on slopes. 6. Swing-out tray for easy maintenance access.